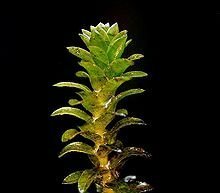 The Banana Plant (Nymphoides aquatica) gets its name from its banana-shaped roots, which are generally visible on the substrate of the tank and are enlarged in order to allow the plant to store nutrients. The leaves of the Banana Plant are rounded and placed at the top of long stems, and are usually a light to bright green with hints of red. This is definitely one of the most attractive looking plants to include within the goldfish tank! The Banana Plant originates in Florida, where it can be found in gentle streams, lakes and rivers. 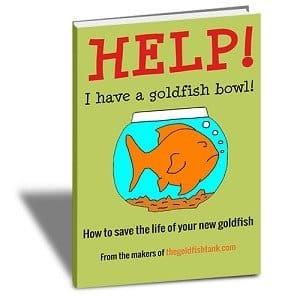 Despite originating from one of the warmer regions of the world, the plant manages fine within the average unheated goldfish tank, provided that it is not located in a particularly cold area of the home. The Banana Plant is best placed towards the front of the tank where it can be used as a focal point, and it is a hardy plant that survives placement in deeper water and low light. Ideally, it should receive moderate levels of light, and be kept in a pH level of 6-7.2. 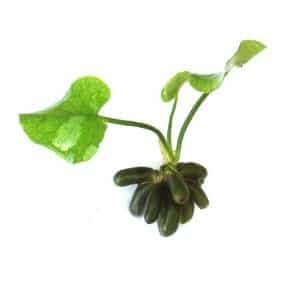 Despite its exotic appearance, the Banana Plant doesn’t require any specialist care, and simply adding a good quality general aquarium fertilizer to the tank will take care of the plant’s nutritional requirements. The Banana Plant lives on average for 2-3 years, and grows to around 6” tall. Plant directly into the substrate, leaving around half of the banana-like roots exposed. 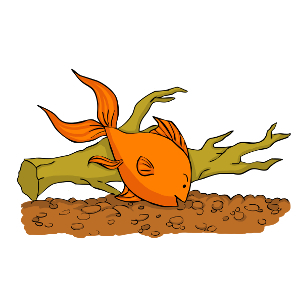 Goldfish enjoy nibbling on the plant’s new shoots, but will tend to leave the formed roots and larger leaves alone. The nutrient-rich roots of the plant can provide a valuable source of supplementary food for your goldfish, and help to oxygenate the water. While Banana Plants are readily available to buy in many specialist aquarium retailers and online, they are less commonly stocked by the average small pet shop. You might want to phone ahead to see if your local store has any in stock before making a special journey! You can also try ordering them online from specialist mail order retailers. A small Banana Plant will usually set you back around $8.